Shredder in the first TMNT comic. The Shredder (Oroku Saki) is a fictional supervillain appearing in the Teenage Mutant Ninja Turtles comics and all of its related media. In every incarnation of the TMNT stories, he has been the archenemy of the Turtles and Splinter, and usually serves as the main antagonist. He is the leader of the ninja and criminal organization known as the Foot Clan. In 2009, The Shredder was ranked as IGN's 39th Greatest Comic Book Villain of All Time. Shredder's physical appearance remains fairly consistent in most incarnations of the character. Saki is a muscular Japanese man, most frequently seen in "the Shredder" persona, wearing a suit of armor vaguely based on that of a samurai, sometimes with a cape. The armor consists of blade-covered metal plaques on his shoulders, forearms, hands (sometimes just his left hand, because he is left-handed), and shins; he wears a purple, gray, blue, or red robe that variously appears to be simple fabric or a form of chain mail. He also tends to wear a metal helmet with a trident-shaped ornament on top, and a metal ninja style mask which covers his face, leaving only his eyes visible. In the 2003 TMNT series, the Shredder is a red alien Utrom named Ch'rell, who utilized an indestructible exo-suit to disguise himself as a human named Oroku Saki. In truth, though many TMNT fans who became fans via the first animated series see Shredder as a REALLY important part of an ongoing, long-running battle with the Turtles, I don't think Kevin or I ever did. Yes, he was an important part of their history, and they probably would not have come into existence without his involvement in their world (or more accurately Splinter's world)... but that's about it. Other than bringing Shredder back for "Return to New York" (and the few issues preceding that set that arc up), I never missed him in any of the other TMNT books I worked on. In the original comic books from Mirage Comics, Oroku Saki is the younger brother of Oroku Nagi who had been killed by a fellow ninja Hamato Yoshi (the owner of Splinter, the Turtles' mentor) in a feud over a woman named Tang Shen resulting in Yoshi fleeing with Shen to the United States. Thirteen years later Saki was challenged by the Ninja Turtles, who were the result of an accident exposing four ordinary turtles to radioactive waste. They were trained by Yoshi's pet rat Splinter, who had also been mutated by the same substance, to avenge his former master. After a lengthy rooftop battle where Saki seemed to be winning, Leonardo managed to plunge his sword through Saki's torso. Defeated, he was offered the opportunity to commit seppuku (ritual suicide), but Shredder refused and detonated a thermite grenade, in an attempt to take their lives as well along his. But at the last second, Donatello used his bo to knock Shredder off the building to his death. However, it was not yet the end of the Shredder. He returned on Christmas Eve seemingly resurrected with an army of Foot Ninjas severely beating Leonardo and burning down the apartment of the turtles' ally April O'Neil, forcing them to go into hiding outside the city. A year later, in the story "Return to New York," the Turtles returned to settle the score with the Shredder. Leonardo faced off against Oroku Saki alone, during which Saki revealed he was brought back to life by a technique using worms feeding on his body and recreating his cells to reform his body. In the battle, Leonardo decapitates the villain, finally killing him, and the four turtles burn his body at the Hudson River.In the Zulli's trilogy in issues 31,35,and 36,Shredder attacks the turtles and Splinter before being defeated.Shredder also appears in the dream of Donatello in Volume 4 where he is shown fighting him. Oroku Saki appears brifly in the image comics issue 3 of Tmnt and The female ninja Pimiko from the comic book series' Volume 3 claims to be Shredder's daughter. In the second volume of the anthology series Tales of the Teenage Mutant Ninja Turtles story "Worms of Madness" it is shown that a few weeks after the events of their final battle the Shredder had yet another resurrection of sorts when a Foot mystic reactivated the worms; however, the mystic did not resurrect Saki himself but the worm colony which had gained sentience and retained Saki's memories and believing itself to be Saki. The worms then went out to find a new body and chose that of a shark. After the Foot Kidnapped Splinter, the turtles managed to engage the "Shredder-Shark" in battle and defeating it by severing its connection to the mystic and the creature realizing that it was not the real Saki. The "Shredder-Shark" returned once more kidnapping Casey's adopted daughter Shadow to lure the Turtles into a trap. With the Turtles away, it was up to Casey and Splinter to defeat it and rescue Shadow, finally killing the creature. Throughout a considerable part of the Image comic series, Raphael tries to impersonate Shredder by wearing his armor. Following this, he is accepted as the leader of the Foot Clan. In later issues of the series, a mysterious Lady Shredder appears to challenge Raphael. Although the book was canceled before her identity could be revealed, writer Gary Carlson confirmed after the fact that she was meant to be Karai. In Volume Four series, Leonardo encounters Oroku Yoshi, a Battle Nexus contestant wearing armor almost identical to that of the second animated series' Shredder. His connection to Oroku Saki and the Foot is not known, since the bi-monthly comic was ultimately cancelled in 2010.In issue 32 he was called to meet a mysterious individual who asks to bring Leo with him as well. Another Version called Doctor Shreddarius also appears in a reality where the turtles are superheroes. The Archie Comics' series use the same background as the 1987 cartoon, as the first issues are identical. Later in the Archie comics, Shredder travels to the future and works with Armaggon and Verminator X to offset the skill and experience of the future versions of the Turtles. This version of the character was more in line with the early episodes' depiction of the character as a cunning adversary and in many issues nearly proves to be a lethal enemy, coming close to defeating the turtles on a number of occasions, and even aids Armaggon and Verminator X in the defeat and capture of two of the turtles in the future. His final fate within the Archie comics series remains unknown, though a three-part mini-series put out by Archie comics after the end of their regular comic series seems to indicate he remains a consistent foe to the turtles for many years, briefly restoring Splinter to the form of Hamato Yoshi and also undoing Michaelangelo's mutation, though both later revert to mutant status by the end of the story, while Shredder was left in a vegetative state in the aftermath of his final battle with the Turtles. In feudal Japan, Oroku Saki was a high-ranking member of the Foot Clan along with Hamato Yoshi. While Yoshi focused on his family, Saki surpassed him and was promoted to Jonin (leader) of the Foot. After an argument on his style of leadership, Saki sent ninja to murder Yoshi's wife, Tang Shen, and later Yoshi and his four sons. With the help of Kitsune, Saki steals regenerative ooze from an Utrom known as "The Iron Demon" (later revealed to be Krang himself) which is used to preserve his body until he is awakened by his descendant Oroku Karai several centuries later in modern-day New York. During his time in stasis, his spirit conquered the realm of the Afterlife, where he learned he was destined to rule the earth world and eventually return to the Afterlife as a lost soul. Knowing the future, he vows to change it by conquering the realm of the Afterlife upon his return. Shredder first appears in Micro-series #1 and in full costume on the final page of issue #9. Dan Duncan first designed Shredder with input from Mateus Santolouco and Kevin Eastman; originally wanting to depict a "beefy...monster" he decided to simplify the design and slimmed down the character based on the original Mirage design. Seeking control in his forthcoming battle for power, Shredder offers Splinter a place in his army but Splinter refuses, revealing himself to be a reincarnated Hamato Yoshi. Saki then reveals his own identity and attacks Splinter, almost killing him when the Turtles arrive to rescue their father. Impressed by Leonardo, he orders his capture and conducts a plan involving kidnapping and stabbing Casey Jones. Shredder then has Kitsune brainwash Leonardo to become his new Chunin (second-in-command) and uses him for a show of strength to the criminal underworld. After the Turtles rescue Leonardo, Shredder calls a meeting with Krang and proposes an alliance in exchange for Utrom technologies, which Krang rejects. A short battle results in retreat on both sides and the revelation that Shredder had stolen some Utrom resources from Krang's compound to begin creating a mutant army (in the form of Bebop, Rocksteady, Koya and Bludgeon). In Issue #50, Shredder faced Splinter and the turtles in a final battle which he lost and briefly admitted his faults and also making Karai the new head of the Foot Clan. He was then killed by Splinter by having his sword slashed into the back of his head, killing him instantly. After his death Shredder's body is kept in a crypt that is guarded by Jennika who was assigned by Hamato Yoshi in order to learn humility. Shredder's tomb is eventually desecrated by the witch Kitsune who plans to revive Oroku Saki in order to restore order to the Foot Clan but Splinter knew this and keeps the skull to foil her attempts. Shredder will appear in the upcoming miniseries Shredder in Hell. In the mini series Shredder is in the afterlife and descends into the underworld trying to find the truth of his own soul meanwhile Kitsune uses his corpse to summon her father as his host. Shredder also fought his past life Takeshi Tasuo in his inner conflict until Splinter/Hamato Yoshi later shows up to help him against the forces of Hell. In the 1987 animated series, Oroku Saki and Hamato Yoshi were both members of the Foot Clan in Japan. After Saki framed him for the attempted murder of a visiting sensei, Yoshi was forced to exile himself to New York City, where he lived in the sewers with four pet turtles that were accidentally dropped down a storm drain. In the following years, Saki took leadership of the Foot Clan, and took on his Shredder persona. He also met a trans-dimensional alien called Krang, and used the advanced technology at his disposal to replace the Foot Ninja with robots called the Foot Soldiers. He secretly moved to New York, where he found Yoshi still alive. In an attempt to kill his old foe, Shredder dumped mutagen in the sewers. This mutates Yoshi into Splinter, and he starts training the also mutated Turtles in ninjutsu. Shredder was voiced by The Fresh Prince of Bel-Air co-star James Avery for seasons one to seven and William E. Martin for seasons eight and ten, with the alternates being Dorian Harewood and Pat Fraley in 1989, Jim Cummings in 1991–1993 and Townsend Coleman in 1993. In the 2009 crossover movie Turtles Forever, this incarnation of the Shredder was voiced by Load Williams. In the 2012 series, the 1987 version of the Shredder is voiced by Kevin Michael Richardson. In his early appearances, Shredder was presented as extremely cunning and was described by Splinter himself as the most dangerous adversary he ever faced. Shredder's intelligence persevered throughout his various portrayals, and in several instances it is claimed that Shredder has an IQ of 300. As the 1987 cartoon series was more light-hearted than the comics, Shredder was later depicted as an evil but incompetent villain rather than the dire and lethal ninja he was originally shown to be. He and Krang are constantly bickering about tactics and often take pleasure in the other's failings (and sometimes intentionally sabotage each other). His two henchmen Bebop and Rocksteady are especially incompetent and fail miserably at everything they do. They were mostly used for comic relief in the show; however, the Turtles certainly consider them to be formidable (despite their inane stupidity) in combat due to their great strength and endurance, and as such, often use their intelligence to outwit them. Despite Shredder's failings, he is still shown to have considerable skills. In martial arts, he is often shown to surpass the Turtles and to be equaled only by Splinter. Nevertheless, he usually runs away from a fight when outnumbered, incapacitating the Turtles to defeat them in combat; as the series progressed, however, the Turtles were able to battle him on more equal grounds and even defeat him in combat on several occasions. He trained the Punk Frogs in a very short period of time to be a match for the Turtles, but the Punk Frogs soon switch sides. His technical skills are also quite impressive: he designed and built a robotic body for Krang, prepared the mutagen mixture, knew how Krang's teleportation engine worked, and built numerous other advanced devices. Ironically in one episode "Shredderville" the Turtles dream they find themselves in a mirror universe where the TMNT never existed and Shredder rules New York City, yet finds the task of ruling so burdensome that he has a nervous breakdown. From season eight onwards, Shredder was depicted as a more serious threat, full of anger and bloodlust, though he was still easily defeated by the Turtles. His friendship with Krang also appeared to have grown. There were many times that Shredder could have just left Krang at the mercy of the Turtles or Lord Dregg, but he always rescued him, and went as far as to donate his life energy to save him. Shredder's family is presented in three episodes. In the episode "Shredder's Mom", Shredder's mother Miyoko helps Shredder and Krang in an attempt to destroy the world's climate. In this episode, Miyoko first learns of her son's criminal activities, and proves herself to be as villainous. However, she constantly treats Shredder like a baby, until he gets fed up with it and transports her back to her retirement home. In the episode "My Brother, the Bad Guy", it is revealed that Oroku Saki has a younger brother, Kazuo who works as a police lieutenant in Tokyo. Kazuo and the Turtles try to join forces to stop one of Shredder's plans, but his fervent respect of the law clashes with the Turtles' "whatever it takes" attitude. Finally, the episode "The Legend of Koji" features Saki's distant ancestor Oroku Sancho, who lived in Japan in 1583. He is the leader of a small clan, and every bit as wicked as his descendant. When Shredder offers to help him find magical relics that would provide him with power and wealth, Sancho takes Shredder's information, then betrays him and orders his men to kill him. However, Sancho is also a coward, and when he breaks down in the face of danger, his men abandon him. This family tree leads to a bit of confusion regarding whether Shredder's given name is Oroku and his last name Saki (as indicated by the fact his brother shares the name Saki), or the other way around (as indicated by the fact his ancestor's last name is Oroku). This question is never resolved on the show, although Mirage comics adds more evidence for Oroku being the family name; Saki's brother is "Oroku Nagi". This follows Japanese naming conventions, which place the family name before an individual's given name. Counting from the first meeting with the Turtles, Shredder spent eight seasons plotting ways to defeat them. In the season 8 episode "Turtle Trek", the Turtles destroy the engines of the Technodrome, trapping it and its inhabitants in Dimension X for good and putting an end to Shredder's plans. He spent the next two seasons in Dimension X, until he was contacted by Dregg ("The Power of Three"). Dregg arranged for him and Krang to come back to Earth, to help him fight the Turtles. Together, they capture the Turtles, but Dregg then betrays them and tries to drain the life energy of the Turtles, Krang, and Shredder all at once, making them weaker while Dregg becomes stronger. Shredder alone escapes the trap and restores Krang ("A Turtle in Time"), but Dregg captures them again. Finally, the Turtles spoil Dregg's plan and transport Shredder and Krang back to Dimension X ("Turtles to the Second Power"). In the series finale "Divide and Conquer", the Turtles return to the Technodrome in Dimension X to take Krang's android body, which they need to fight Dregg. Shredder is nowhere to be seen, but it is assumed that he is still somewhere in Dimension X. He and Krang also appear in Turtles Forever, with the Technodrome still under New York City before being sent into the 2003 universe. However, Shredder and Krang's incompetence (as well as their relative sanity) is fully shown when the Utrom Shredder of the 2003 universe seizes command of the Technodrome and adds Utrom technology to the powerful war machine, and turns it against the world. In the climax, Shredder temporarily overcomes his hatred for the Turtles as both he and Krang decide to help the Turtles defeat the Utrom Shredder who they realise is totally insane, will kill everyone and has effectively stolen the Technodrome from them. Shredder also takes extreme offense at being considered inferior by his other dimensional counterpart, doesn't see the point of destroying the entire universe and doesn't understand why the Utrom Shredder won't just kill the Turtles when he had the chance. So, with Krang, he chooses to fight alongside the Turtles against their common foe. In Ninja Turtles: The Next Mutation, Shredder is still the Turtles' sworn enemy. This time however, Venus uses her powers to make the Oroku Saki from within take control of Shredder's mind. After the Foot Clan disbands, he ends up living on the streets. Later, the Dragon Lord's rank warriors attack him to get a medallion that was in his possession. Splinter saves him and takes him to the Turtles' lair to protect him. It was hinted that Shredder might possibly go back to his old ways, but the show was canceled soon after that episode. In the show, Shredder wore a general attire similar to the one he wore in the second film, but with a heavily altered helmet/mask due to the lesser budget for the TV series as compared to the movies, which had allowed for more detailed props and costume pieces. Shredder appeared only a few times in the show, due to the primary villain of the series being a draconic being from another dimension and thus supplanted Shredder as the Turtles' nemesis. The "Shredder" identity has been assumed by numerous individuals in the 2003 animated series. All of the Shredders, except for Karai, are voiced by Scottie Ray. In the episode "Tempus Fugit", a future is shown in which the Utrom, Tengu and Cyber Shredders are engaged in a war for control of the city. The Utrom Shredder is the central and the main antagonist of the series. While he is voiced by Scottie Ray in English, Hidenari Ugaki voices him in Japanese. He serves as the show's primary Shredder; he is the archenemy of the Turtles and Splinter, and indirectly had a hand in their creation. After causing the deaths of millions across the universe, the evil alien warlord Ch'rell was captured by his fellow Utrom for his crimes. Upon being transported back to his home world, Ch'rell managed to free himself and sabotaged the Utrom ship, causing it to crash-land on Earth during the Sengoku period of feudal Japan. Marooned on the primitive planet, the Utrom were forced to wait for centuries until human technology advanced enough for them to develop a teleportation device and return home. Thus, they developed humanoid exo-suits to hide among the humans. Ch'rell stole one such suit, and used the Japanese legend of a Demon Tengu to craft a dual identity, becoming a wealthy Japanese philanthropist named Oroku Saki, while secretly operating as the crime lord Shredder. He soon founded the Foot Clan, which grew into a massive underground criminal empire by the 20th century. He eventually adopts an abandoned girl named Karai, whom he personally trained in the arts of ninjutsu. While in New York City to establish a branch of his organization there, Ch'rell locates Hamato Yoshi, one of the Utroms' foremost guardians, and kills him after he refuses to reveal their location. During the struggle, Yoshi's pet rat, Splinter, escapes and winds up in the city's sewers, where he and four baby turtles are accidentally exposed to mutagenic ooze created by the Utroms, causing them to mutate into sentient humanoid lifeforms. Over a decade later, the Turtles begin encountering the Foot Clan and unknowingly foil several of Ch'rell's operations. The Shredder later reveals himself as the Foot's leader and confronts the Turtles, becoming their greatest enemy after they refuse to join the Foot. The Turtles and the Foot would then clash time and time again, with the Shredder mysteriously surviving every encounter despite suffering lethal injuries. Ch'rell eventually reveals his true nature to the Turtles in the Utrom's base, where the Shredder sought to exact his revenge on his species. Though Ch'rell is later trapped in the imploding building, he once again manages to survive. During Ch'rell's recuperation, Karai travels to New York to assume leadership of the Foot Clan, ending a turf war for control of the city and supposedly making peace with the Turtles. But when Ch'rell fully healed, the animosity between the Turtles and the Foot returned. In the aftermath of the Triceraton invasion, New York City is severely crippled and Oroku Saki uses his fortune to help repair the damage, while secretly retrieving remnants of the Triceratons' technology to construct a starship. The craft is eventually completed, but Ch'rell's plan suffers several complications, courtesy of the Turtles and Agent Bishop. Despite sustaining heavy damage, the ship is launched into orbit, albeit with the Turtles and Splinter on board. Entering a four-armed Shredder exo-suit, Ch'rell easily defeats them all, prompting the Turtles and Splinter to attempt to sacrifice themselves and blow the ship up in a final attempt to stop the Shredder. As the ship explodes, the Utrom arrive and teleport all of its inhabitants to safety. On the Utrom home world, Ch'rell is placed on trial and found guilty, resulting in his eternal exile on a frigid asteroid. In the finale film Turtles Forever, Ch'rell is freed from his exile by his Shredder counterpart from the 1987 series. Ch'rell then takes over the Technodrome, and gains a new, more powerful exo-suit resembling his old one, only larger in size. He later uses the Technodrome to view alternate dimensions, realizing that there is an entire multiverse of Ninja Turtles. Locating the Turtles' source planet, Turtle Prime, Ch'rell vows to eliminate every Ninja Turtle in the multiverse by destroying this dimension. The Mirage Turtles, the 1987 Turtles, and the 2003 Turtles team-up to stop Ch'rell, who is ultimately defeated, though Karai and Splinter agree that Ch'rell will return again as he always does. In "Same As It Never Was", Donatello is transported to an alternate future in which Ch'rell has succeeded in conquering Earth. By then, he had already killed Splinter and Casey Jones, and removed Michelangelo's left arm and Raphael's left eye. When Donatello leads a final rebellion against the Shredder's fortress, his Foot forces kill Michelangelo, while Karai personally kills Leonardo and Raphael. Despite having his most powerful exo-suit yet, the Shredder is ultimately killed by Donatello with the Tuneller. In the sixth season (Fast Forward) episode, "Timing is Everything," Leonardo and Cody Jones are accidentally sent back in time to the aftermath of the Turtles first battle with the Shredder. During their battle, Shredder notices "something different" about his foe. Later, Shredder and several Foot ninjas are transported to 2105, but are easily outmatched by the Turtles futuristic technology. In the IDW comics Ch'rell was introduced as a separate entity and was a cornal for the Utroms and later sided with Krang. He was freed by Krang's followers. The Tengu Shredder is a demonic entity from ancient Japan. When on the verge of death, he possessed a human named Oroku Saki, one of Japan's most skilled warriors, but he was eventually defeated by the power of the Ninja Tribunal. This Shredder is thus also known as the One and True Shredder and Real Shredder. His body, helmet and gauntlet were separated and each sealed away to prevent his resurrection. In the 21st century, the Tengu Shredder was awakened by his five mystic heralds, forcing the Ninja Tribunal to recruit the Turtles and four human warriors as their Acolytes to defeat him. Upon rising from the dead, the Tengu Shredder remakes New York City into his own wasteland. To stop him, the Turtles recruit Karai, the Justice Force, and even enemies Bishop, Baxter Stockman, Hun and the Purple Dragons to fight back. Despite overpowering all of them, the Tengu Shredder is weakened when Karai drains his power via a mystic link (which connects all who take the mantle of the Shredder). After a long and brutal battle, the Tengu Shredder is finally destroyed when the Turtles combine their Dragon avatars to summon the spirit of Hamato Yoshi to deliver the final blow. The Cyber Shredder appears as the main antagonist of the seventh and final season, Back to the Sewer. As the Turtles and Splinter attempt to return to their present time, their old enemy Viral from the future takes over android Serling to exact revenge. After being defeated, Viral escapes into the Internet and finds a Foot data vault. She tries to hack it, but is absorbed instead, giving rise to the Cyber Shredder, a digital copy of Ch'rell that was originally confined to cyberspace until he became a physical being. After suffering many near-death experiences, Ch'rell created this digital backup of himself in the event that anything happened to his physical form. The Cyber Shredder shared the Utrom Shredder's mind, but featured a radically redesigned version of Ch'rell's humanoid exoskeleton suit and armor. After several confrontations with the Turtles, the Cyber Shredder sought to escape cyberspace and enter the real world by any means necessary. He ultimately succeeded and aimed to take over New York, but was stopped by the Turtles and Casey Jones. The Cyber Shredder later returned and attacked the Turtles at April and Casey's wedding. Along with their many allies, the Turtles and Splinter fought back and defeated the Cyber Shredder by erasing him with a de-compiler previously used against Viral. Karai is the adopted daughter of Oroku Saki (Ch'rell), who takes the mantle of the Shredder after her father's exile. She is voiced by Karen Neil. After some lesser battles, she doffs the mantle and begins a non-hostile relationship with the Turtles, particularly towards Leonardo. The Shredder appears as the main antagonist of the 2012 animated series, voiced by Kevin Michael Richardson. His Japanese origins as Oroku Saki and brotherly relationship with Hamato Yoshi is mostly intact, with the Foot Clan and the Hamato Clan being later revealed as having a long-term rivalry before the Hamato family killed the Oroku family, wiped out their entire clan (starting with the destruction of the Foot Clan monastery) and took in the orphaned Saki as their own. Despite being raised as brothers, both Saki and Yoshi eventually became rivals due to the love of Tang Shen, whose decision to marry Yoshi drove Saki to discover his true heritage and turn on his former brother, eventually destroying everything Yoshi held dear, including the lovely Tang Shen (whom he had killed by accident) and the entire Hamato Clan (starting with the destruction of the Hamato Clan monastery, which resulted with Saki's head getting burned scarred and hairless). Blaming Tang Shen's untimely death on Yoshi, Saki returned to his biological family and became the new leader of the newly restored Foot Clan, tutoring ninjutsu students such as world-famous martial artist Chris Bradford and Brazilian street thug Xever Montes, sharing criminal business with business partners such as Russian arms dealer Ivan Steranko, Italian food critic Don Visiozo and Hun, and owning a pet akita named Hachiko (named after the akita of the same name) who played a part in Bradford's mutation into Dogpound after Hachiko bit him. Shredder first appeared in the end of "Rise of the Turtles, Part 2" where he traveled to New York when he learned that Hamato Yoshi is training his own ninjas after seeing a shuriken with his clan symbol on a shuriken left behind by the Turtles during a recent fight on a TV news report. Determined to finally end his age-old rival's life, he sent the Foot Clan after the Turtles until he made his first confrontation with the Turtles in person in "The Gauntlet," where victory was seemingly in his grasp before he was distracted by the mutating Bradford and Montes. Although Shredder planned to kill former TCRI inventor Baxter Stockman for interfering with his plans to kill the Turtles in "MOUSERS Attack," he changed his mind by commenting on how Stockman's scientific knowledge could be useful to him. Shredder is also Karai's father, as seen in "New Girl in Town". However, in "Showdown," during Shredder's battle with Splinter, he reveals that in the aftermath of the fight that caused Tang Shen's death, he took Splinter's daughter, Miwa, and raised her as Karai. He has told her that he is her biological father and it was Splinter who killed her mother, as she has sworn revenge ever since. Shredder initially dismissed the Kraang's presence in New York, but after capturing one, decided to ally with them to destroy the Turtles. The partnership seems stable, though it would seem the Shredder still did not fully trust his new allies. Early in the second season, in "Follow the Leader," he left for Japan, leaving Karai as the interim leader of his Foot Clan. He ordered her not to attack the Turtles nor make any dealings with the Kraang behind his back, and was livid when his adoptive daughter disobeyed him. He returned in "The Manhattan Project," with Tiger Claw, a Japanese circus performer who was mutated into Shredder's deadly assassin and new first lieutenant. Tiger Claw was able to bring Splinter before him, but complication from a Kraang operation in the city and the Turtles' own efforts rob Shredder of his chance to kill his old foe once again. In "The Wrath of Tiger Claw," Shredder and Tiger Claw attempted to use Karai to set a trap for the Turtles, but when she saw a photograph of Hamato Yoshi, Tang Shen, and herself as an infant, she realized that the Turtles were telling the truth and sided with them, resulting in her being captured while buying them time to escape Tiger Claw. Shredder still cared about his adoptive daughter, though, as seen in "The Legend of the Kuro Kabuto," where he visited her in her cell and explained why he kept everything a secret and hoped that she will one day understand. After his helmet, the titular Kuro Kabuto, was stolen by professional thief Anton Zeck on behalf of Steranko, Shredder found Zeck's calling card on a glued-down Rahzar and ordered the entire clan before him. Explaining the helmet's history as a special Foot Clan relic, he had the clan hunt for Zeck, sending Fishface with Stockman-Fly and Rahzar with Tiger Claw. Leonardo later confronted Shredder with the Kabuto for a trade and kept him busy long enough for the other Turtles to get to Karai. However, the "Karai" Shredder traded them with turned out to be a dummy rigged with a bomb as the Turtles evaded it. In "Vengeance is Mine," Shredder attempted to use the real Karai as bait for a trap that would mutate the Turtles into snakes that would kill Splinter, but the plan backfired when Karai was exposed to the mutagen, turning into a snake and almost attacking Splinter before she fled after regaining control of herself. In the two-part second-season finale, "The Invasion," Shredder and Kraang Prime formed a full alliance in which Shredder and the Foot Clan will help the Kraang take over New York and then the world and in turn the Kraang would return Karai to normal, and deliver Splinter and the Turtles to him. Later, he watched as Leonardo fought and eventually defeated his army of Foot Bots, after which he sent Rahzar, Fishface, and Tiger Claw to take care of him. Leonardo managed to subdue them for a short period of time before Shredder got involved and badly injured Leonardo. Later, Splinter confronted him and the two battled until Splinter got trapped under large metal pipes. Shredder was prepared to kill his rival once and for all, however Leatherhead intervened, and was defeated when Shredder sliced the front of his torso and kicked him of the edge of the dock. Splinter became furious as he broke out from under the pipes and tackled Shredder to the sewers. Later, the Turtles (minus Leonardo) and April watched helplessly from behind metal bars as Shredder defeated Splinter and seemingly killed him by throwing him down a large draining bay. In the middle of the third season, in "Return to New York," tensions began to grow high within the Foot of their alliance with the Kraang, but Shredder convinced everyone that he will keep his promise to take the city back from them. After a feral Splinter was found by the Foot-Bots and taken before him, Shredder had Stockman-Fly work on restoring his memory, which is what April did instead with her Kraang powers when she, the Turtles and Casey Jones returned to the city to rescue their sensei. In "The Pig and the Rhino," Shredder sent Bebop and Rocksteady to find Karai again, like they did recently before the Turtles helped her escape, or else they'll be given something even more painful than mutation. After the Turtles unknowingly led them to her, the two succeeded in re-capturing Karai (while the Turtles weren't looking) and delivering her back to Shredder, who promised to fix everything he's done to her. The Kraang invasion eventually came to a stop made by the Turtles and the Mighty Mutanimals, but its effects had eventually gave Shredder a gift for his cooperation with the Kraang, which shifted the balance of power within the city's criminal underworld over to the Foot. For him, this was achieved by gaining control of the Purple Dragons and other Asian gangs through Hun, several South American gangs through Fishface, the Russian mob through Rocksteady and the Sicilian mob through Vizioso. By using this power, Shredder had these crime groups aid him with collecting various chemicals from a chemical company called Aumen Chemicals, an abandoned Kraang lab and Vizioso for a mind-control serum that he planned to create and use on the Turtles, the Mutanimals and Karai. In the two-part Season 3 finale, Annihilation: Earth! he briefly teams up with Splinter to stop a black hole machine that was to destroy the Earth. He briefly fought the Triceratons until he followed Splinter, double crossing and stabbing him in the back, killing him instantly in front of the turtles. They rushed to Splinter while April blew Shredder away with a blast from her mind. Proclaiming that his victory over Splinter is more important to him than even saving the world, Shredder is sucked into the black hole along with his followers and Splinter while the turtles, April and Casey escape Earth's destruction and then in "Beyond the Known Universe," they travel back in time to six months earlier in an effort to prevent this event from happening. In "Earth's Last Stand" these events were revisited, but the arrival of the Turtles from the future resulted in Shredder's attempt to murder Splinter being thwarted. The two engaged briefly in battle with Splinter proving victorious, and the unconscious Shredder was carried away by Tiger Claw. In City at War, due to the injuries he sustained from Splinter, Shredder has been confined to a hospital bed under the care of Stockman with Bebop and Rocksteady as his bodyguards. When Tiger Claw returns to report the loss of an entire weapons cache thanks to the Turtles and Karai back in Manhattan, making it clear Karai wants to take Shredder down one piece at a time by destroying his criminal empire before taking him out, Shredder decrees that if it's a war Karai wants, it's a war she'll get, before Stockman hooks an I.V. filled with mutagen up to Shredder, and as the mutagen is injected into Shredder, his eyes open wide as the mutagen takes effect. In The Insecta Trifecta, Shredder is still receiving the mutagen drip as he now turns to Stockman as his last hope due to his undying loyalty since Tiger Claw and the others have become useless as of late in stopping Karai and the Turtles. When Stockman returns to report his mission a failure, Shredder is not worried about it, revealing to Stockman that his mutagen drip is finally taking effect as Shredder deploys a pair of blades from the back of his hand, right out of the skin itself. In "The Super Shredder" Shredder forces Stockman to give him the rest of the mutagen drip, which mutated him into his Super Shredder form, although it ended up monstrous he was still pleased. Shredder then collects his henchmen and travels back to his old lair. Karai tries to fight the Shredder along with Shinigami but Shredder easily knocks Shinigami unconscious and he escapes with Karai. He then notices a van coming straight towards him, (The Shell Raiser) and flips it over. He tells the turtles to have splinter meet him at the place that he last beat him. Shredder then sets the vehicle on fire and the turtles flee to the sewers. Shredder then creates a trap for Splinter and the Turtles, which is full of photos of Splinter, Tang Shen, and Karai. When Splinter enters he drops bars of iron to avoid them from escaping. He then light fire towards them but they jump underwater. As the Turtles, Splinter, and April continue to approach Shredder, Karai makes a remark and Splinter follows, but later finds out he was led into another trap. Shredder forces Splinter to fight him but Splinter escapes, ready to set up a plan of his own. Splinter leads Shredder to the Undercity, where he puts his plan into action. Shredder eventually finds Splinter and he steps on his tail. Shredder then takes Splinter deeper into the UnderCity, where he decides to finish him. Just as Shredder was about to strike Splinter, his arm started to lose control, causing him to step back. Splinter then throws a blade at a few gas tanks and both Splinter and Shredder fall to their deaths. However, in the following episode, "Darkest Plight", Shredder and Splinter are separated during the fall, and Shredder returns to the top of the Under-city to be rescued by Tiger Claw, who takes him back to recover before hunting down the Turtles. While Tiger Claw deals with April and Karai, Shredder goes after Leonardo, and nearly crushes him to death before Karai and April arrive to help. During the battle, Shredder tosses a wrecked fuel tanker semi-truck at Karai, only for April to catch it in her psychic grip, causing her Sol Star crystal to cause her eyes to glow blue and smile malevolently before hurling it back at Shredder. However, before Shredder can kill Leo, Karai pleads with him to reconsider doing something good in his life instead of being consumed by his vengeance. This lures Shredder in close enough for Karai to hit him in his most vulnerable spot: His exposed, pulsating mutated heart. Weakened, Shredder is saved by Tiger Claw, who drives him back to their hideout, where Shredder demands a larger dose of the mutagen from Stockman. When Tiger Claw objects, knowing it is too dangerous, Shredder overpowers him, forces Stockman to administer the dosage and roars as the mutagen takes effect as Tiger Claw watches in horror and fear. In "Tale of Tiger Claw", he is shown as a M.O.U.S.E.R. hologram to warn Tiger Claw of his next move against Splinter. In "Requiem" he returns to New York City, far stronger and more vengeful than ever before. He shows up at the hideout where Karai is planning her next move with Shnigami and the Mighty Mutanimals. He defeats the Mutanimals effortlessly and badly injures Karai in the process. On the WOLF building, he faces off against Splinter, Slash, Raphael, April and Casey. He ultimately manages to murder Splinter and hurls him from the building to his death. He is then blasted by a tremendously powerful psychic wave from an enraged April, and is crushed by a garbage truck, though he again survives the onslaught. In the Season Four finale, "Owari" he has his lackeys prepare for the inevitable arrival of the Turtles, April and Casey. He burns down his new lair and confronts the Turtles in a final showdown on the roof. His unique mutation makes him immune to Donatello's retro-mutagen, which allows him to beat Raphael, Donatello and Michelangelo all at once, leaving only Leonardo left standing. After a heated one-on-one duel, Shredder is finally killed by Leonardo. Many months later, the Kabuto and his own heart were separated by unknown means and hidden in secret locations throughout New York. His heart was contained within a glass vial that came into the possession of Don Vzioso, which Tiger Claw and Kavaxas seek, as it is essential to revive him and then came back in a zombie like form that wanted to die. In the 2018 animated series Shredder appears as the demonic leader of the Foot Clan, who terrorized Japan until he was defeated by Splinter's ancestors 500 years ago and his armor was scattered across the world to prevent his return. The Foot Clan, allied with Baron Draxum, are collecting the armor pieces to resurrect him. The Shredder was played by James Saito in the first movie and by François Chau in the second, while his immense Super Shredder form was played by professional wrestler Kevin Nash. In all cases, the character was voice-acted by David McCharen. The Shredder's costume was, in the first movie, originally the same as in the original comic, with a red color. However, this was changed in the sequel to a violet color, reflecting the more cartoonish nature of the second film. In both movies, he also had a silver and black cape. In the Japanese versions, the Shredder is voiced by Norio Wakamoto (1st movie in VHS version), Hidekatsu Shibata (first movie in TV version), and Takeshi Watabe (second movie). James Saito as The Shredder in the film Teenage Mutant Ninja Turtles (1990). In the first movie Teenage Mutant Ninja Turtles, Oroku Saki and Hamato Yoshi were rival martial artists in Japan and both loved a woman named Tang Shen. Shen, who loved only Yoshi, persuaded him not to fight Saki honorably; instead, they fled for the United States. Saki followed them to New York City and murdered Tang Shen alone in her home; when Yoshi returned from his construction job and discovered Shen's body, Saki ambushed and killed him as well. Yoshi's pet rat Splinter escaped during the fight and clawed Saki's face. In return, Saki sliced a small part of Splinter's ear with his katana and left. After this incident, it was said that Saki is never heard from again. The comic book adaptation of the film retains the original comic book origin story, with Oroku Nagi being slain and Saki coming to America to seek vengeance. Saki, in the "Shredder" persona, establishes an American branch of the Foot Clan. With the aid of his second-in-command Tatsu, he manipulates and recruits troubled teens as brutal yet Machiavellian leader and father figure, teaching them ninjitsu to make them into skilled thieves and assassins. Shredder sends the Foot Clan to "silence" April O'Neil when she reports on the Foot Clan's connection to the recent crime wave, inadvertently leading them to the Turtles' hideout when Raphael saves April. Shredder had Splinter kidnapped and imprisoned him in his warehouse hideout, and has the Foot Clan hunt the Turtles. He beats Splinter while interrogating him about how the Turtles learned their fighting techniques. After the Turtles successfully defeat the Foot Clan in a final assault, Shredder confronts them on a rooftop. He defeats all of the Turtles with his superior skills and threatens Leonardo with his yari to force the others to toss away their weapons. Splinter, freed by Turtles' allies, Danny Pennington and Casey Jones, intervenes and reveals to Shredder that they met years ago, as he was Hamato Yoshi's pet. Shredder unmasks himself, revealing the scars that Splinter gave him, and charges towards Splinter to impale him. Splinter counters with Michelangelo's nunchaku to vault him over the edge of the building and he falls into a parked garbage truck far below. Casey Jones then activates the crushing mechanism; the viewers are then shown a closeup of the Shredder's helmet being crushed, implying his death. In the second movie Teenage Mutant Ninja Turtles II: The Secret of the Ooze, the Turtles believe that since Casey had crushed him in the garbage truck, the Shredder was dead. It is soon revealed that Shredder had survived the crushing and revitalized his Foot Clan to get vengeance on the Turtles. After finding the Foot "fallback" headquarters (a junkyard), he sent a member of the Foot to follow April, hoping to find the Turtles through her. When April's team was doing a report on T.G.R.I. in New Jersey, Freddy (a member of April's team, and Foot agent) found some mutated dandelions and sent one to the Shredder. He then orders Tatsu to obtain a sample of the T.G.R.I. mutagen that mutated the Turtles, as well as kidnap researcher Jordan Perry. Using the last mutagen and Perry's research, the Shredder creates his own mutants, Tokka and Rahzar, from a stolen snapping turtle and a brown wolf respectively. Though initially enraged at their infant-like intelligence, he soon plays it to his advantage by manipulating the mutants as they imprinted him as their surrogate parent. After a failed attempt to kill the Turtles in the junkyard using a captured Raphael, Shredder unleashed Tokka and Rahzar onto a city street to "have fun" and destroy it. The Foot spy then gave April a message for the Turtles: that the Shredder would turn the mutants loose on Central Park next if they did not accede to a rematch at the construction site. After the Turtles de-mutate the two mutants (with help from Perry) and defeat Tatsu in a nightclub, the Shredder appears and threatens to mutate an innocent woman with a small reserve mutagen vial (the canister was knocked away by the Turtles' new human ally, Keno). Before he can mutate her, he is stopped when the Turtles play a keytar at full volume, sending the Shredder flying through a window from the force of a blown speaker. When the Turtles follow him outside on a pier, they discover that the Shredder has used the mutagen vial on himself. He is transformed into a massive "Super Shredder," an almost mindless giant-mutant being with immense superhuman strength. During his fight with the Turtles, Super Shredder knocks down the pier's pilings in a mindless rage, which then collapses onto him with the Turtles falling into the water below. Though the Turtles survive, the Shredder meets his demise from getting crushed by the destroyed pieces of the pier. The Shredder did not appear in the third film but is shown briefly at the beginning of the fourth film to help give the backstory of the Turtles, and his helmet that he wore in the 1990 film is visible on Splinter's shelf of mementos at the end of the movie. The possibility of his return is also strongly hinted at in the end of the film by Karai. However, the established storyline was abandoned in favor of the 2014 reboot. Japanese American actor Tohoru Masamune portrayed the Shredder in Teenage Mutant Ninja Turtles. Initially, William Fichtner was intended to portray a Caucasian version of the Shredder, with the anglicized real name of Eric Sacks, instead of Oroku Saki. This idea was abandoned late in production in favor of featuring a Shredder of authentic Japanese ancestry, and the film went through re-shoots to change Fichtner's character of Sacks into being the Shredder's student. The change came too late to alter the film's Nintendo 3DS tie-in video game, and Sacks remains the Shredder in it. In contrast to much of the brand's history, Sacks, not Shredder, is the character connected to the Turtles' origins, having created them alongside April O'Neil's father; the Shredder (never referred to with any name other than his codename) has no connection to Splinter or the Turtles, and while he is shown to have scars on his face, it is not revealed how he suffered them. In the earliest stages of development for the film, Shredder was reimagined as "Colonel Schrader", the military leader of the black-ops unit "The Foot", revealed later in the script to be a yellow-skinned, red-eyed alien with the ability to sprout spikes. This idea was dropped after Evan Daugherty was hired to rewrite the script in early 2013. In the film, Shredder is the leader of the Foot Clan, who is terrorizing New York City. After a vigilante stops the Foot Clan, Shredder orders the Foot to take hostages down the subway in order to lure the vigilante out. Later in the film, Shredder's adopted son, Eric Sacks, informs Shredder that the vigilante is in fact four mutated Turtles who are test subjects of Project Renaissance, a science experiment of April O'Neil's late father. Sacks gives Shredder an armed suit and a helmet, the latter and the Foot Clan attack the Turtles' lair, where he defeats Splinter and kidnaps three Turtles after Raphael was presumed dead. Sacks drains the Turtles' blood in order to create mutagen so that he can complete his and Shredder's plan: the latter will release a virus across the city and Sacks will sell the mutagen as a cure for the disease, making him even richer. As Shredder prepares to release the virus, the Turtles escape and confront him. Although he nearly defeats them, the Turtles were able to conquer Shredder with the help of April, which causes him to fall from the building on which he stood, but he survives and is shown to have a sample of the mutagen. Brian Tee portrayed Shredder in the 2016 film, Teenage Mutant Ninja Turtles: Out of the Shadows. In the beginning of the movie, the Foot Clan, led by a scientist named Baxter Stockman, attempt to help Shredder escape from prison. Although the turtles try to prevent the escape, Stockman was able to help Shredder escape using a teleportation device. But Shredder is hijacked mid-teleport and ends up in a place called Dimension X. There, he meets Krang, who gives Shredder a mutagen canister in exchange for a promise to find the three components of a machine that Krang sent to Earth long ago, which when united will open a portal to his dimension. Shredder returns to New York City and recruits two criminals named Bebop and Rocksteady and has Stockman use Krang's mutagen to transform them to powerful animal mutants- a warthog and rhinoceros. Shredder, Bebop and Rocksteady find the components in a museum in New York and in a jungle in Brazil. Shredder and Stockman unite the components, creating a portal to Krang's dimension. Shredder betrays Stockman and has his men take him away, but upon entering the Technodrome, Krang immediately betrays Shredder, freezing him and locking him away with his collection of other defeated foes. As the original TMNT video games are mostly based on the 1987 cartoon, Shredder is often based on his first cartoon incarnation. He usually executes some plan to provoke the Turtles into retaliating and defeat them; these include kidnapping April O'Neil and stealing the Statue of Liberty. Shredder is usually the last boss in the games. Teenage Mutant Ninja Turtles (NES, 1989): Shredder is the final boss. He is found at the end of the Technodrome level. He causes the Turtles to lose roughly half their energy if he touches them, and has a gun that can de-mutate them instantly killing them. He wears a red costume in like in the Mirage comics. Teenage Mutant Ninja Turtles (arcade, 1989): Once again, Shredder is the final boss and is found at the end of the Technodrome level. He is armed with a sword, and has the ability to clone himself (the exact number of clones is one more than the number of Turtles attacking him in the arcade version). Shredder and his clones also have the ability to shoot lightning bolts from a device on the helmet, which de-mutate the Turtles they hit, killing them. When Shredder or one of his clones is close to death, his helmet falls off, a unique occurrence in the game series. Teenage Mutant Ninja Turtles: Fall of the Foot Clan (1990): This game was the first one not to feature Shredder as the final boss. Instead, Shredder is the boss of the penultimate stage, which is set in a river. It is also the first game in which Shredder does not have the ability to de-mutate the Turtles. His only attack is a sword swipe, but he can teleport if hit. The final boss is Krang. Teenage Mutant Ninja Turtles: The Manhattan Missions (1991): In this PC game, Shredder fights the turtles in his Manhattan hideout, decorated in a Japanese style. His appearance is based on the Mirage comic version. Teenage Mutant Ninja Turtles III: The Manhattan Project (1992): This game is the first to feature both a battle against Shredder and a second one against a mutated Super Shredder. The first battle takes place at the end of the Technodrome level, which is the sixth of the eight levels of the game. In this battle, Shredder uses a sword to attack the Turtles. Shredder later returns as the final boss of the game, on the stage set in Krang's spacecraft. This time, he mutates himself into Super Shredder, much as he did in the second movie which had been released earlier the same year (1991). Super Shredder has two superpowers, the ability to call down lightning, and the ability to shoot fireballs. These fireballs can de-mutate the Turtles, but unlike other games, this is not an instant kill. Teenage Mutant Ninja Turtles II: Back from the Sewers (1991): A sequel to Fall of the Foot Clan, this game also features Shredder as a regular level boss and Krang as the final boss. He does not have the ability to de-mutate the Turtles, but he does have a wider variety of attacks than in the previous Game Boy game. Shredder returns later in his mutated Super Shredder form, as a sub-level boss of the final Technodrome level. However, in this incarnation, his only super-power is the ability to teleport elsewhere on the screen. He attacks the Turtles using a sword. Teenage Mutant Ninja Turtles: Turtles in Time (1991): Shredder is again the final boss of the game, and found in the Technodrome. However, this time, he is not preceded by a Technodrome level. Instead, the Turtles fight through a Starbase level in the future (2100 AD) with Krang as boss, then teleport to the Technodrome in the present (1991 in the arcade game and 1992 in the SNES version) for the final confrontation. Shredder attacks with a sword, and can fire energy attacks. In the SNES port of the game, Shredder begins the battle by mutating himself into Super Shredder, and has the added superpowers of super-speed movement, fire ground attacks, ice air attacks, and a de-mutating fire ball which costs a turtle a life. The SNES port also added a Technodrome level earlier in the game, which leads to a battle with a regular Shredder. In this battle, Shredder is in a kind of battletank, armed with a machine gun and claws. The player views the action over Shredder's shoulder inside the tank, and the only way to cause damage is to hurl the never-ending waves of Foot Soldiers toward the screen and into the tank. Teenage Mutant Ninja Turtles: The Hyperstone Heist (1992): This game uses a Super Shredder similar to the one in Turtles in Time. His attacks are roughly the same. Teenage Mutant Ninja Turtles III: Radical Rescue (1993): Unlike its two predecessors, Fall of the Foot Clan and Back from the Sewers, this game does feature Shredder as the final boss. However, this time Shredder has become Cyber Shredder, half-man and half-machine. This form of Shredder possessed deadly kick moves and energy ball attacks, as well as being the only boss in the game with two life meters, as the meter instantly refills after it is drained the first time. Teenage Mutant Ninja Turtles: Tournament Fighters (1993): This is the first game in which Shredder is not a boss but instead a regular playable character. Furthermore, his costume is based on the Mirage comics version. Finally, in the SNES incarnation of this game, he appears under the name Cyber-Shredder, but there is no indication that he has become a cybernetic being as in Radical Rescue. After a 10-year hiatus, a new series of TMNT games was initiated. These new games are based on the 2003 cartoon series, and likewise, Shredder in the games is the same as in the cartoon. Teenage Mutant Ninja Turtles (2003): Shredder appears as the final boss. The Turtles face him on the helicarrier at the top of the Foot Helicarriers; he wields the Sword of Tengu in this fight. Shredder's combo attacks are quick and nearly continuous. When half of his health bar has been depleted, his attacks become much faster. There is also a secret final boss in which the player faces Shredder as Oroku Saki. His combos are much quicker and deadlier, and he also has a temporary powered-up state. Teenage Mutant Ninja Turtles 2: Battle Nexus (2004): The game begins a short while before the end of the previous game, and Shredder is encountered by the Turtles in the second stage of the game—however, he is not fought by the player, only in a cutscene. As in the cartoon, Shredder is defeated, but he survives the assault on his headquarters. Shredder resurfaces in the TCRI building later on, but once again, the player does not directly fight him; the main goal of the mission being to evacuate the Utroms back to their home planet. He is seemingly killed in the destruction of the TCRI building, but he once again survives. In a sub-plot exclusive to the game, he is detailed as being a mass murderer of Utroms on their homeworld, and he gave Utrom mercenary Slashurr a permanent scar. He later wiped Slashurr's memory, and employed him to kill the Turtles. However, Slashurr eventually remembers his past, and with the Turtles, battles Shredder and the Foot on his ship. The Turtles eventually defeat Shredder once again. In the Battle Nexus fighting tournament mode, Shredder appears as the final boss of the Foot Fight tournament, though the nature of these tournaments when it comes to the game's canon is questionable. Teenage Mutant Ninja Turtles: Mutant Melee (2005): Shredder appeared as a playable character and opponent in three forms—his standard armor, without the armor (as Oroku Saki), and a golden "Mega" Shredder. Teenage Mutant Ninja Turtles 3: Mutant Nightmare (2005) The third chapter of the game, "Exodus", deals directly with the Turtles thwarting the Foot's efforts. As in the third-season finale, the Turtles and Splinter battle the Foot at their headquarters, and follow the Shredder aboard his starship. They nearly sacrifice themselves to kill Shredder as well, but the Utroms rescue them, and exile Shredder to a distant ice asteroid forever. Shredder is also encountered in the dark future as one of the final bosses of the Nightmare chapter of the game. TMNT (2007): In the console versions of the 2007 movie-based game, Shredder appears as a boss in a flashback-within-a-flashback (as the events of the game are told to Splinter after their occurrence). 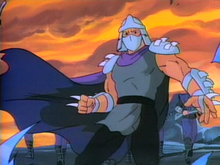 The armor of Shredder in this game is based on the 2003 cartoon series version. TMNT: Smash Up (2009): Shredder is a playable character in the PS2 and Wii fighting game. He appears in both his Utrom Shredder and Cyber Shredder forms. Teenage Mutant Ninja Turtles (2014): The Nintendo 3DS game based on the 2014 film, Shredder, who is actually Eric Sacks, appears as the final boss. However, after defeating him, it is revealed that it was all an illusion created by Baxter Stockman, to allow the real Shredder to escape. In the anime adaptation Mutant Turtles: Choujin Densetsu-hen, the backstory from the original cartoon was preserved. Unlike the rest of the main cast, Shredder's appearance was changed to match the Supermutants Shredder toy that was being sold at that time. The manga explained this by saying his original outfit was destroyed in a battle with the Turtles and Krang created the new armor for him. Shredder also gains the ability to transform into the dragon Devil Shredder using the Mutanite crystals he stole from the Neutrinos. With the energy from the evil sprite Dark Mu, he was later able to transform into the gigantic Dark Devil Shredder. In the second volume of the anime he gets his Tiger Spirit Metal Mutant armor. He was voiced by Kiyoyuki Yanada. Shredder also made a guest appearance in an episode of the hit YouTube show Death Battle. In the episode, his weapons and abilities were analyzed against X-Men villain Silver Samurai. In the end, Shredder proved himself the better fighter and beat his opponent. ^ a b Greenberg, Harvey R. (15 April 1990). "Just How Powerful Are Those Turtles?". The New York Times. Retrieved 7 August 2010. ^ Chris Jenkins (16 August 2014). "10 Strangest Facts About The Teenage Mutant Ninja Turtles". Listverse. Retrieved 21 January 2017. ^ The Making of 'Teenage Mutant Ninja Turtles': Behind the Shells. 1991. ^ Eastman, Kevin; Laird, Peter (2012). Teenage Mutant Ninja Turtles: The Ultimate Collection, Vol. 2. San Diego, Calif.: IDW. p. 227. ISBN 161377088X. ^ "Pimiko (comic book character)". Comicvine.com. Retrieved 2014-05-08. ^ "Image Comics' TMNT "Volume 3" #5". Miragelicensing.com. Retrieved 2014-05-08. ^ "TMNT Cartoon Episode 70!". Ninjaturtles.com. Archived from the original on 2011-06-05. Retrieved 2014-05-08. ^ "TMNT Cartoon Episode 108!". Ninjaturtles.com. Archived from the original on 2012-02-10. Retrieved 2014-05-08. ^ "TMNT Cartoon Episode 159!". Ninjaturtles.com. Archived from the original on 2012-02-04. Retrieved 2014-05-08. ^ "TMNT Cartoon Episode 178!". Ninjaturtles.com. Archived from the original on 2012-02-10. Retrieved 2014-05-08. ^ "TMNT Cartoon Episode 189!". Ninjaturtles.com. Archived from the original on 2012-06-08. Retrieved 2014-05-08. ^ "TMNT Cartoon Episode 190!". Ninjaturtles.com. Archived from the original on 2007-03-20. Retrieved 2014-05-08. ^ "TMNT Cartoon Episode 191!". Ninjaturtles.com. Archived from the original on 2012-06-08. Retrieved 2014-05-08. ^ "TMNT Cartoon Episode 194!". Ninjaturtles.com. Archived from the original on 2012-06-08. Retrieved 2014-05-08. ^ "Film Review: 'Teenage Mutant Ninja Turtles'". variety.com. Retrieved August 4, 2014. Several years later, a crime wave is in full force in the city, led by a walking Cutco display called the Shredder (Tohoru Masamune) and his massive Foot Clan, though they've started to get their asses whupped by a stealthy troupe of martial-arts-savvy vigilantes. ^ "'Crossing Lines': William Fichtner Reveals 'Sons Of Anarchy' Star Joining Show". Huffington Post Canada. Archived from the original on June 24, 2013. Retrieved June 22, 2013. What are you doing in "Ninja Turtles"? I play Shredder. It is cool. It's one of those things that came along where I thought, "Really? Let me think about this for a minute." [Laughs] Then I was like, "Yeah, OK, this sounds like a journey." I'm very glad that it worked out, I'm really glad that I'm doing it. ^ "'Teenage Mutant Ninja Turtles': William Fichtner's Shredder is an entirely new character". Zap2it. Archived from the original on March 31, 2014. Retrieved July 2, 2013. Actually, I play a guy named Erik Sacks in the film," Fichtner tells Zap2it. "And Erik Sacks goes though ... a few changes ... let's just put it that way. ^ "William Fichtner is NOT Shredder". Superhero Movie News. Retrieved July 19, 2014. ^ "William Fichtner Talks Shredder and 'Ninja Turtles 2'". Retrieved December 31, 2014. ^ "IGN: Teenage Mutant Ninja Turtles: Smash-Up Screenshots (Wii) 2966717". Wii.ign.com. Retrieved 2014-05-08. This page was last edited on 23 April 2019, at 09:36 (UTC).